This steel bracket is used to hold Body Grip Traps. Nail the bracket to the ground, a limb, log, tree, or stake it where you want to locate the trap. It holds the body grip so it wont tip, twist, slide to the side, fall over or be knocked over. Reset the trap after a catch in seconds. Coni Mount I: Sizes 110-120. Coni Mount II: Sizes 150-280. Coni Mount III: Sizes 330. HAGz Spring Clip - Body Grip Stabilizer Small: for 160s and smaller fit on 3/8 inch rods and X-Large: for 220s-330s fit on 1/2 inch rods. These HAGz Spring Clips are designed to work by their-selves on 3/8 and 1/2 inch rods or in conjunction with the HAGz Bracket for extreme versatility. Small and non-invasive, the HAGz Spring Clip XL is inserted through the Spring Coils where it remains always attached, never forget it, and does not interfere with the spring eye. Uses gravity to mount/lock in position on the rod, simply slide it where you want and let go, easily adjustable to any height on the rod making it a very quick and versatile body grip stabilizer. Use it in conjunction with the HAGz Bracket to stabilize a Body Grip Trap virtually anywhere (rocks, logs, etc.). Our favorite is to double up on catches by using a Spring Clip/Body Grip in a run with a HAGz Bracket/Baited set up top. Due to the size of larger traps, it's recommended to place a cross stick or additional rod between the jaws to prevent any spinning. Traps can be set separate from clip and twisted into place. For more stable positioning with 220s use two clips spaced apart. Regular Price $12.95. 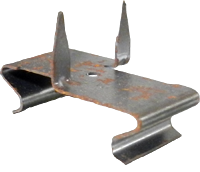 This handy little bracket can be nailed to a tree or welded on a stake or lag bolt. When nailing to wood, just bend the flange down with pliers and you have two holes to nail through. Dozens of uses. For 110,120, 160, & 220 body grippers.